The Come, Follow Me for Individuals and Families manual does a beautiful job of focusing on the atonement of Christ, His suffering and sacrifice. We are going to focus on the context in which the events of the last week of His life took place. From that time forth began Jesus to shew unto his disciples, how that he must go unto Jerusalem, and suffer many things of the elders and chief priests and scribes, and be killed, and be raised again the third day (Matthew 16:21). And shall deliver him to the Gentiles to mock, and to scourge, and to crucify him: and the third day he shall rise again (Matthew 20:17 – 19). The members of the Sanhedrin knew their scriptures and so did the people. This was a brazen statement by Christ that He was the King of the Jews. The people fully participated and hailed Him as the Messiah. The waving of palm branches is symbolic, a part of Feast of Tabernacles that welcomes the Kingdom of Heaven on Earth and represents final judgment and salvation. But when they sought to lay hands on him, they feared the multitude, because they took him for a prophet (Matthew 21 43 – 46). Woe unto you, scribes and Pharisees, hypocrites! for ye compass sea and land to make one proselyte, and when he is made, ye make him twofold more the child of hell than yourselves (Matthew 23:15). In Matthew 24 we see Christ preparing His apostles, giving them prophecies of the Last Days. Matthew 25 begins with Christ saying that it’s two days until the Passover and they need to make preparations. If you look at a daily account of the last week in Christ’s life, Wednesday is empty and Christ is crucified on Friday. Christians have struggled for centuries to make Friday-to- Sunday work out to be three days and three nights in the tomb. It doesn’t work, because Christ was crucified on Thursday. Christ celebrated the Passover one day earlier than most people in Jerusalem, on Wednesday.When Christ commanded the Passover celebration, it was to last 8 days, but by the time He was born, the Jews had contracted it to 7 days. Christ, His disciples, and the Essenes followed the old pattern. He was crucified on Thursday and taken down from the cross for the High Holy Sabbath first day of Passover. There were two Sabbath days in a row that year, with the normal Sabbath day, Saturday, the next day. Christ left that Wednesday feast suffer in Gethsemane and to be betrayed and arrested. He was thrust before the Sanhedrin to be tried according to Jewish law. The Law of Moses includes trial law, and the Sanhedrin broke many of those laws when they tried the Savior. The irony must have been profound, since Christ is the one who gave them that law. Christ was then sent to Pilate, to Herod, and then back again. He was presented to the people and then left to the Romans to fulfill the wishes of the Jewish leaders. 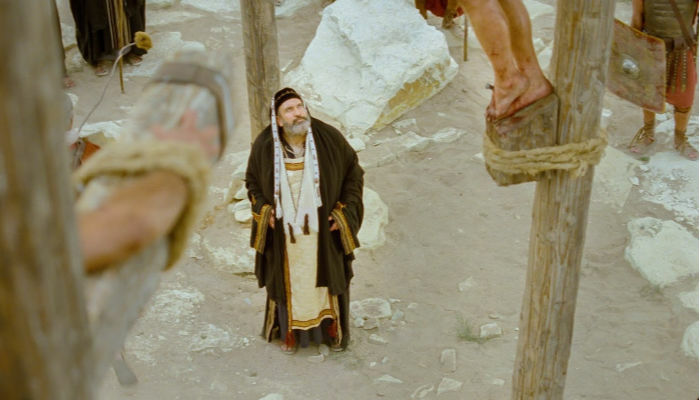 Don’t put too much stock in the group of Jews choosing Barabas over Jesus or yelling “crucify Him”! Caiaphas and his cronies made sure that the crowd was full of their own sympathizers. Christ was crucified on Thursday afternoon. Thus, Christ was crucified at the same time as most of the lambs in the temple. He was taken down from the cross before sundown on Thursday for the High Holy first day of Passover Week. He was in the tomb a full three days and three nights. He rose the morning of Bikkurim, the Honored Son wave offering, symbolic of the resurrection. Richard K. Scott wrote a paper showing that Christ was crucified on Thursday using the Book of Mormon account. You can find it in the Perks section of Third Hour or at this link.